Majority of people usually love to take trips in mountains regions like Himachal or Uttrakhand. At the end of the trip sometimes we wonder to live permanently there. Don’t we..??? We don’t want to escape from the smell of mountains, the cool climate, the smooth raw air, the mind-blowing landscape, greenery. These little things make us realize that we are a part of them and we are connected to some extent with each other. This obstacle can be crossed with the Pacific Golf Estate by Pacific India, a luxury residential luxury housing which is shadowed by towering Himalayan peaks and is full of unspoiled natural beauty. They are ready to move in apartments in Dehradun which are offering all types of apartments ranging from 4bhk to 2 bhk apartment in Dehradun. One can explore all the things they desire with nature, mountains, rivers and much more. This is a project which is attached to nature and at the same time is luxurious with all the modern facilities and amenities which make this project the best project of Dehradun. Also, this project is well connected with various modes of transportation and other modern features like beautiful landscapes, sports complex with all sports facilities like Squash, Club House, Tennis, Badminton, Swimming Pool, Basketball, etc. Well, living in Dehradun is also an excellent place to get off the beaten track. If you’re looking for fresh air and tranquillity and natural essence. 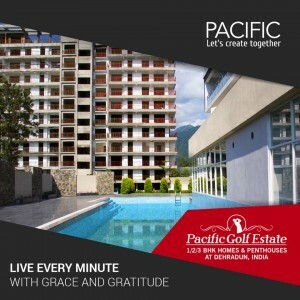 Now you don’t have to take trips to visit mountains as you can live here in Pacific Golf Estate and enrich your life by living in the heart of nature and mountains.